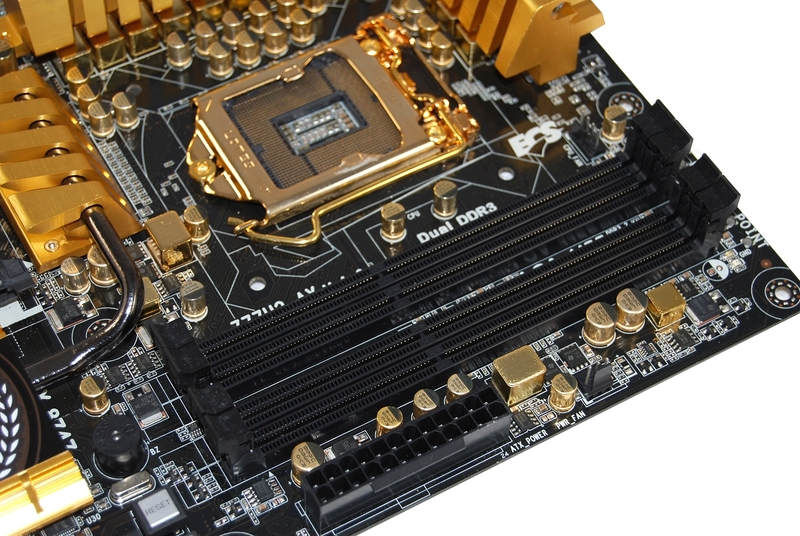 The Z77H2-AX is one seriously dope looking motherboard. Fit for a sultan, it's the kind of board we'd expect to find in a Burj Al Arab server room. We understand if you think the design a little tacky. 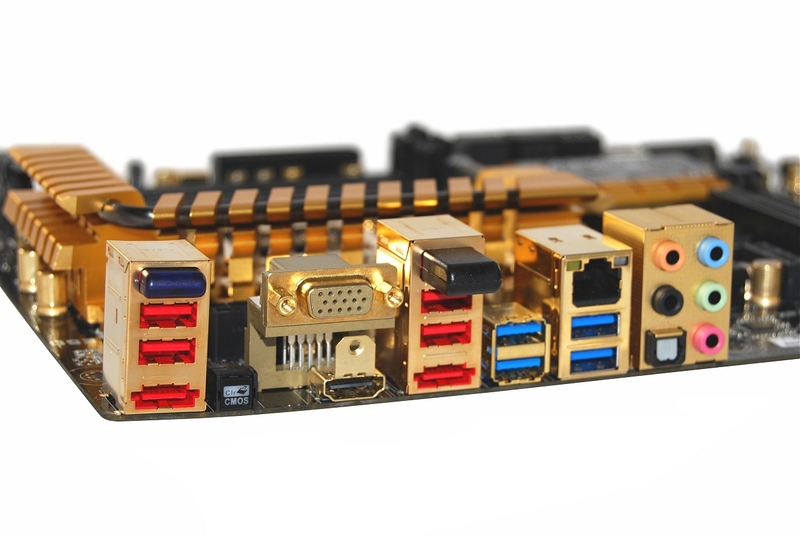 For us, the gold I/O panel connectors put the Z77H2-AX over the line. If nothing else, it's a unique option among the conventional black, blue, red and white-themed designs from other players. Aesthetics aside, the Z77H2-AX seems well-equipped with features including wireless networking and Bluetooth support via the Atheros AR971L and AR3001 controllers which connect via USB 2.0. Networking is tackled by a Realtek RTL8111E Gigabit LAN controller, while audio is handled by a Realtek ALC892 8-Channel High Definition codec, a common solution among mid-range and high-end boards. ECS employs a Texas Instruments USB 3.0 xHCI compliant host controller to further expand USB 3.0 capabilities. The Z77's four USB 3.0 ports are located on the I/O panel, while the TUSB7320 adds two front ports via an onboard header. One ASmedia ASM1061 chip provides a pair of extra onboard SATA 6Gb/s ports, while one of the four Z77's 3Gb/s ports is relocated to the I/O panel and one is removed. ECS revives legacy PCI support with the ITE IT8893E which offers three ports, though only two are used. Thankfully, there are also two PCIe x1 slots and a Mini PCIe x1 slot, as well as two PCIe 3.0 x16 slots. 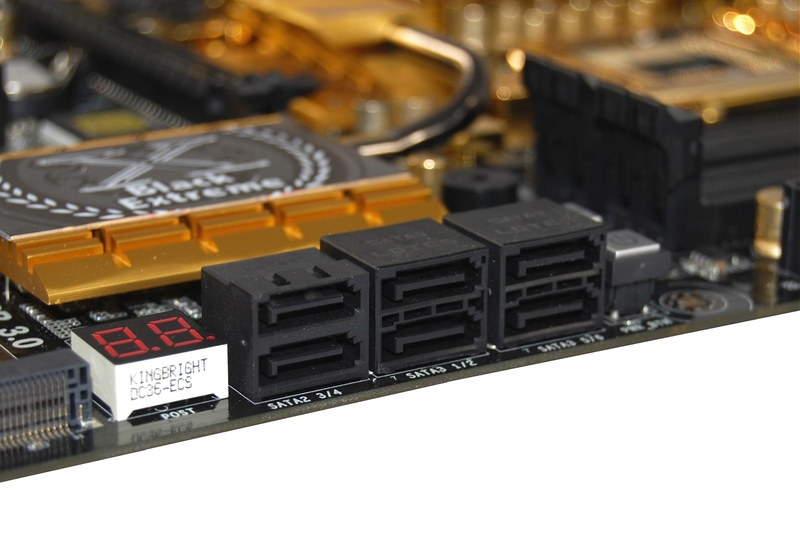 ECS doesn't include a third PCIe x4 slot for triple graphics cards. The first half hour playing with the ECS Z77H2-AX was spent in the BIOS because we faced a frustrating error "System Boot Failed. Force into Setup." Even after repeatedly clearing the CMOS, we couldn't get the board working correctly. We continued tinkering and eventually the board started playing nicely, but we don't know how or why. A little while later, we tried overclocking and got the same error. While the Z77H2-AX might have loads of bling on the outside, its software lacks the same flair. ECS needs to survey the competition and reevaluate its UEFI design as we've yet to see a decent version from the company. The Z77H2-AX's launch software is exceptionally bad and we hope ECS offers an overhaul.